What was the weather doing at 1115 UTC on Monday November 29, 1999 when I heard the station on 87.7 MHz FM? There appears to be a large high pressure to the ESE of Florida extending across most of the mid-Atlantic. A weather front appears to cross the coast of the USA near North Carolina, and then curves NE towards Europe. Does anyone have any ideas as to how this might explain the propagation? Could the signal have been ducted most of the way along the weather front and then been effectively "downlinked" by a single meteor ping? It was 6.15 am Eastern time, which is about an hour before dawn. These two pictures were screen grabbed from their RealVideo archive of Nov 29, 1999. 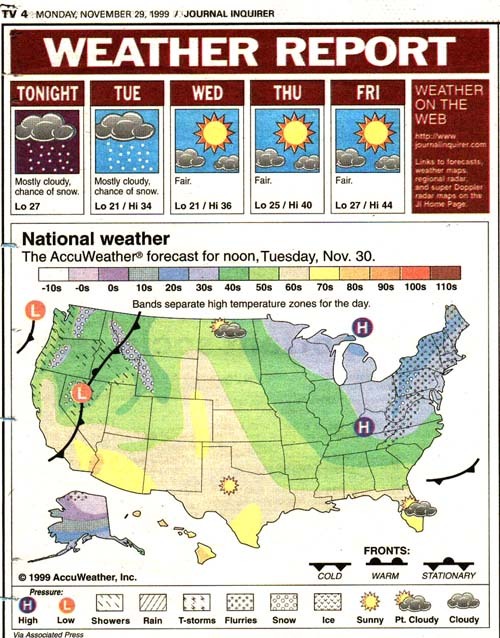 This picture was grabbed from the noon (1200 GMT) weather forecast on Nov 29, 1999. This picture was scanned from the Journal Inquirer and is a forecast for 30 Nov. Notice the cold weather coming in behind the weather front. 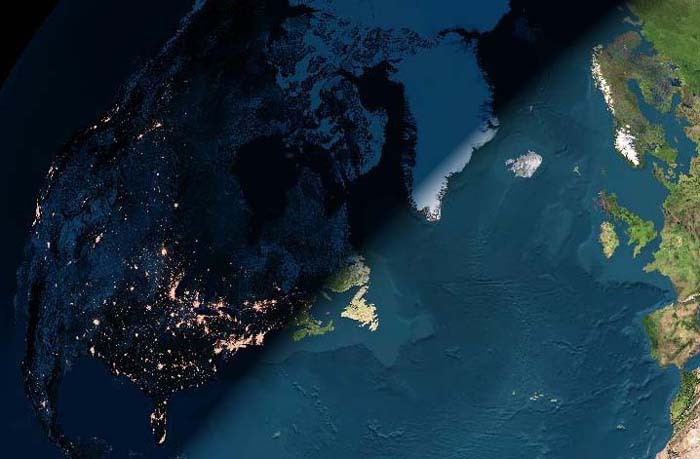 This is a day/night world view from Formilab's living earth model.